I have to share this recipe with you - it's perfect if you're overrun with zucchini and basil, and is a fast, healthy, and delicious summer meal. It's a favourite at our place! Cook pasta, until al dente. Drain, keep warm. It's best to do this first, as the sauce comes together very quickly. Heat oil in large pan (I like to use a wok), add garlic and zucchini. Cook and stir until softened. 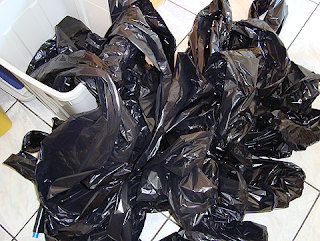 Around 5-8 minutes. Add pepper and basil. Mix well. Stir zucchini sauce through the pasta. Serve topped with pine nuts and parmesan cheese. Yummy!! This quantity serves around 6. 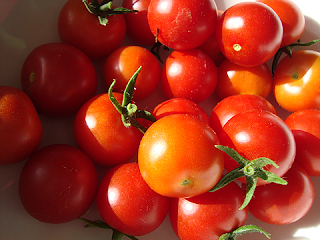 Check out these little beauties - the first of my cherry tomato crop! The plants have got so big they've fallen over (I've tied them up in part now). More to come - nothing better than home-grown tomatoes. I now have a multiple handset cordless phone (bliss), and will come up with different ways to survive without a fax machine (interactive PDFs, sending from my Mac, etc). On a more serious note - I had my first mammogram a week ago - it was a 'diagnostic with ultrasound' scan (not just a plain screening), which was worrying. The experience was much less awful than I'd been expecting (being gifted in the bustal region seems to help), and thankfully all is well. Phew bloody phew. I just have non-cyclical mastalgia (probably a peri-menopausal thing). Not pleasant, but not cancer. If you're getting on (I'm mid-40s), have any breast cancer in the family (my maternal aunt), and have any changes, please please don't wait before seeing your GP. It's so much better to check it out sooner rather than later. Mostly it's fine, and it's better to know! oh that's a nice sounding recipe. I have just a few zucchinis to try and get through right now although in my house, a large one is 1349g - just ask George - she was the lucky recipient of that one! Slow roasted home grown cherry tomatoes are divine!!!!!! try it sometime when you've got more than enough! And I hope you are able to stay cool this weekend... it really is quite something, isn't it? oooh YUM!!! That pasta looks delish!!! People have given me lotrs of zuchini and some fancy squash things too, but The Labradors have zucchini with their breakfast. I like zucchini fritters. Yum. It is cooler here now, hope it is at your house too!!! My garden is still entirely full of snow despite what is supposed to be a one-day "heat" wave: the temp. zoomed up to 46 F (8 C) overnight and is supposed to reach the low 50's F.
We really don't need rain on top of about 2 feet of snow, so I will send it down your way if I can! Loved seeing that summer fare on your blog. I just put some zucchinis in a pumpkin soup we just had. Have a good weekend! Oh yummy pasta! And good for you for being so brave about your mamo. I take a couple asprins before I go in, and breeze through it with no sweat. Absolutely, get checked regularly. If things AREN'T OK, the sooner you know, the better! Ignoring a problem rarely makes it go away. 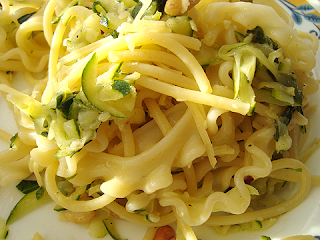 Wishing it were hot here in California and the zucchini were overrunning the garden, as I love summer pasta dishes. "Good on you" for following through on the m-gram and getting it sorted out. reminds me it's about time for mine.